Bentley GTC convertible | What Car? 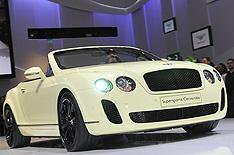 Bentley's GTC convertible took centre stage on the company's stand, here at the Geneva motor show. It's rare to see a car that can appeal to performance freaks and poseurs, but Bentley might have just come up with one at Geneva. The Continental GTC convertible becomes the second Bentley, after the GT coupe, to get the Supersports treatment: a 621bhp 6.0-litre W12 engine, quicker-shifting six-speed automatic gearbox, rear-biased torque split for the four-wheel-drive system, uprated chassis and suspension, reduced weight and distinctive styling modifications. Like the Supersports coupe, the GTC convertible runs on 85% bio-ethanol. The same capability will be extended to the rest of the Continental range later this year. Bentley claims E85 fuel cuts tailpipe emissions by up to 70% on a 'well-to-wheel' basis, because the plants that bio-ethanol is made from absorb CO2 while theyre growing. Sadly, it will be of little benefit in the UK because of the scarcity of E85. Unlike the Supersports coupe, which is strictly a two-seater, the GTC has room for four. It is also the fastest drop-top Bentley ever. The GTC Supersports can hit that mark in less than 10 seconds, and go on to more than double that speed.